What can OAG do for you? from OAG Aviation on Vimeo. With an unrivalled ability to aggregate complex data sets, we deliver real-time flight information insights, compelling visualisations, powerful applications and analytics. Through an unmatched global network of tools, high-quality data, experts and relationships, OAG can unlock hidden sources of value, enabling its customers to innovate and advance their businesses and deliver up-to-the-second actionable solutions, shape smart applications and optimise business operations to enhance their customers’ experience. In short, OAG connects the world of travel. 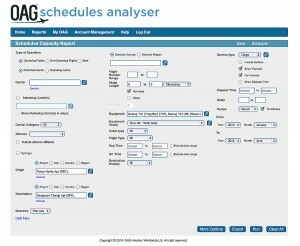 OAG’s Schedules database is the most definitive airline schedules database in the world. With over 80 years of experience in airline data aggregation and synchronisation, we deliver products and solutions to help airports and related services understand and interpret passenger trends, route dynamics and performance. Our products power leading travel service providers, GDSs, OTAs, mobile apps, search engines, travel tech companies, comparison websites and hospitality organisations who rely on the most accurate and up-to-date schedules information to drive their businesses. Using the most comprehensive flight status database in the world, OAG’s suite of flightview products provide accurate and actionable flight status data APIs and applications across the air travel industry. With superior content and coverage, data feeds and alerts, compelling visualisations through digital displays, web and mobile content and access to air traffic and weather information we help our customers, plan, react and craft their strategies. OAG also handles the most comprehensive database of historical flight status information in the industry. OAG’s unique database of millions of flights dating back to 2004 comprises of detailed information that helps customers who need accurate and analytical historical flight status information. Underpinned by the most comprehensive network of air travel data, our analytics products offer solutions that provide timely and accurate insight into passenger trends, schedules analysis, route dynamics and performance. From viewing airport traffic analysis with Traffic Analyser to searching for airport and airline network connectivity in Connections Analyser, OAG’s market leading analytics suite combines powerful software with data you can trust. Using OAG’s tools, you can manage and deliver essential intelligence to drive performance and better decision-making. Our aviation market intelligence team provides bespoke analysis, aviation analytics, historical flight information all for reporting and visualisation purposes to support one-off projects or ongoing analysis requirements.